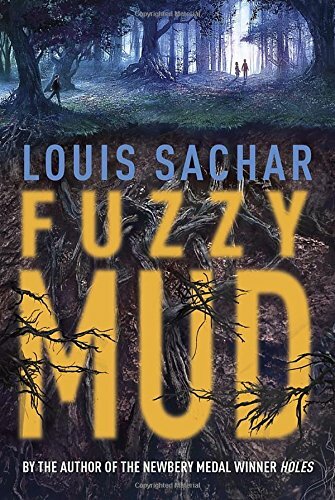 Fuzzy Mud, by Louis Sachar, is a middle-grade novel with a big story hidden beneath a romp of fright and friendship. At the prestigious Woodridge Academy, fifth-grader Tamaya Dhilwaddi is a top notch student who yearns for a place to belong. Struggling to adjust to the changes brought on by the divorce of her parents, her life is further complicated when her best friend starts teasing her for not being cool. Her only refuge is Marshall Walsh, the seventh-grade boy who walks home from school with her every day, but even Marshall’s attitude has taken a sour turn for the worse. Chad Hilligas, resident bully, has picked Marshall as his new favorite punching bag. When Chad dares Marshall to meet him in the forbidden woods near town, Marshall decides to prove that he’s not a coward, and trick Tamaya into coming with him. But what started as a prank turns dangerous when the kids unwittingly stumble into the grounds surrounding SunRay Farm, a factory that secretly produces a renewable energy source called Biolene. A mysterious occurrence has allowed the Biolene to escape the factory and take over the surrounding area, leaving the forest covered in a strange fuzzy mud. After a treacherous venture through the woods ends in a fist fight between Marshall and Chad, Tamaya defends herself by shoving a handful of the fuzzy mud into Chad’s face. As the kids run off their own way, Tamaya gives little pause to the tingling sensation left in her cuts and scrapes, and washes them off at home and goes to bed. The real nightmare begin when she wakes up the next morning, covered in a blistering rash and a bizarre white powder—the dust of her own decaying skin. Then the school’s headmistress delivers the disturbing news that Chad never went home the night before, and Tamaya must decide if she should forgive the pain he caused her in order to save his life. Fuzzy Mud is a morbidly sweet tale of friendship and forgiveness, where Sachar reminds us that people are more than who they seem to be on the surface and that healing can come in the most unexpected of ways. Though a short book, this novel contains some moderately graphic details of disease and would be best recommended for readers who can handle such material, especially if their reading interests include age-appropriate horror. But beware: love for Louis Sachar is sure to spread, driving young readers to devour his books at a speed that would put even the fuzzy mud to shame. Learn more about Louis Sachar and his books!